This report has been prepared by the Amsterdam International Law Clinic and commissioned by the law firm Prakken d’Oliveira Human Rights Lawyers. It is sponsored by the Euro-Mediterranean Human Rights Monitor. The report highlights currently existing gaps or ‘grey areas’ within European Law in relation to the legal definition of ‘Stateless Persons’ and its practical applications within the domestic legal frameworks of EU Member States (EUMS). It particularly addresses the legal status and determination procedure(s) of stateless persons in the Netherlands, and aims at serving as the basis for the formulation of a litigation strategy that could result in a request by Dutch courts for a preliminary ruling from the Court of Justice of the European Union (CJEU). In addition, it is underscored that since not all EU Member States are signatories to the 1954 UN Convention Relating to the Status of Stateless Persons, and the 1961 UN Convention on Reduction of Statelessness, it is problematic for any EU-wide initiative to aim at binding all EUMS to the provisions of those two main international treaties. Furthermore, while acknowledging the main contributions of those treaties, such as the definition of statelessness that can be found in Article 1 of the 1954 Convention; the report speaks on the inchoate nature of those two treaties themselves, particularly relevant to the development of a standard recognition procedure for statelessness. Secondly, the report suggests that a preliminary ruling by the CJEU could potentially be triggered through the characterisation of the term ‘Stateless Persons’ as an autonomous concept of EU law, keeping in mind that under EU law only EU institutions, not the domestic systems of EUMS, are able to interpret such a concept. Lastly, the report turns to The Charter of Fundamental Rights of the European Union and suggests that a request for an interpretation of the term ‘Stateless Persons’ by the CJEU could also be triggered by examining the term in relation to a combination of the provisions of the Charter, particularly Article 1 (Right to Human Dignity), Article 21 (Principle of Non-Discrimination), Article 41 (Right to Good Administration) and Article 47 (Right to an Effective Remedy). The underlying purpose of such a ruling by the CJEU would be to clarify the ‘grey areas’ in European law that the report identifies, thereby generating pressure on the Dutch government to proceed with its plans to establish an effective statelessness determination procedure. It is worth mentioning that the CJEU is the EU body that is mandated with the task of interpreting EU law in a harmonised manner with the provisions of applicable International Law treaties. 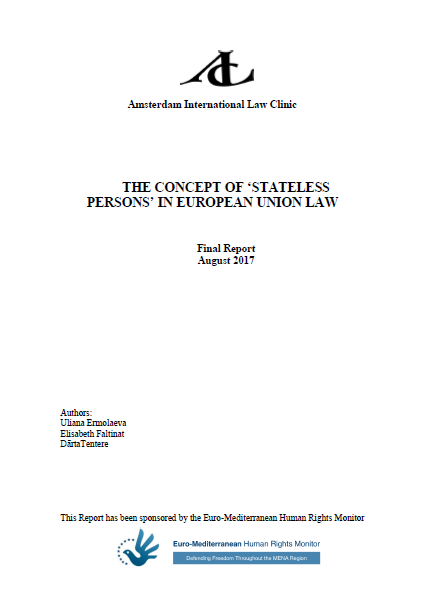 By offering its own interpretation of the exact meaning of the concept ‘Stateless Persons’ and its practical applications, the CJEU would also facilitate the arrival at a standard statelessness determination procedure by all EUMS, thereby alleviating the situation of ‘legal limbo’ that an unknown percentage of more than 760,000 stateless people continue to experience in different parts of the Union.